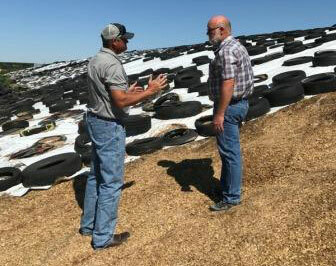 Mycogen Seeds dairy development manager Jim Henry and Silage Testing Sweepstakes winner Ed Hilger discuss the importance of silage quality on Hilger’s farm in Ulysses, Kansas. 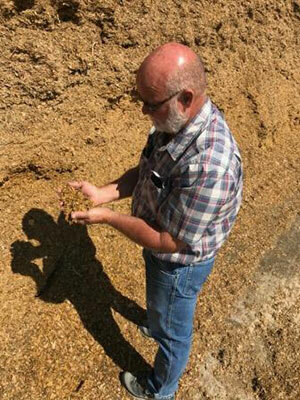 Ed Hilger, a silage corn grower from Ulysses, Kansas, has won a year of free silage testing courtesy of Mycogen Seeds. The Mycogen Seeds Silage Testing Sweepstakes was one way the team at Mycogen demonstrates the importance of testing to properly track the quality and composition of silage. 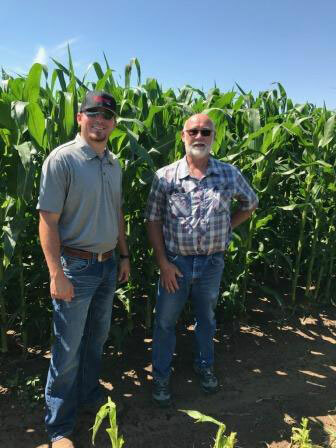 Hilger grows 6,000 acres of corn that is used as silage, earlage or high-moisture corn for a large scale dairy in southwestern Kansas. Hilger uses testing data to evaluate the starch and fiber content as well as the digestibility of his corn silage hybrids. With results in hand, he works with his teams at the dairy and Mycogen to produce a high-quality forage that meets the dairy’s needs. Henry offers these harvest and silage testing best practices as producers near harvest and prepare to store and feed a new silage crop. Pull a quality sample. Corn silage testing starts with a high-quality sample. Producers should remove at least a feeding, or better yet, a day’s worth of silage from the exposed face. Next reach deep into the pile or bag with a cup to scoop a representative sample of silage, placing the silage in a clean, dry bucket. Blend the silage in the bucket and dump it onto a clean, dry and smooth surface for subdividing. Mix thoroughly and cut the silage sample in half with a rigid instrument, like a clipboard. Discard half and remix the remaining half, following the same procedure until the desired amount of silage for sending to the lab for analysis is obtained. Place the final remaining sample in a sturdy, sealable plastic bag, squeeze out as much air as possible and seal the bag. I recommend sending two samples for analysis and averaging the results to minimize sampling error. Work with a trusted lab. There are many labs to choose from when submitting and processing corn silage samples. Be sure to use the same lab for consistency in testing practices, types and procedures. Tell your lab the hybrids you grew. Testing results may vary slightly based on what type of corn silage producers grow. Certain tests may yield more accurate results for particular hybrids. Mycogen Seeds recommends using a lab that practices in-vitro testing (wet chemistry) instead of near infrared (NIR) spectroscopy for measuring fiber digestibility. In-vitro testing provides the most accurate values through a direct analysis of individual nutrients. Test regularly. Corn silage should be tested at harvest and again at least monthly, after opening. If producers expect there to be variation, testing more often is recommended. Moisture content of the silage should be checked on the farm at least weekly or when rain or snow events occur. Throughout the year, producers should analyze samples and adjust their ration to fit the composition of their corn silage to achieve optimum results from the herd. Consult a local expert. Producers should meet with their local nutritionist regularly to pull quality samples, evaluate results and adjust their ration. Mycogen Seeds representative Landon Lukens visits with Ed Hilger to present one year of free silage testing. Silage testing is a fundamental tool for the farm to continuously evaluate quality and adjust to feed the best-possible forages. Hilger now will receive a year of free silage testing to support his goals courtesy of Mycogen Seeds in collaboration with Cumberland Valley Analytical Services. To learn more about Mycogen® brand corn silage hybrids, talk with your local representative or dealer, or visit Mycogen.com/Silage. Mycogen Seeds offers leading genetics in corn, soybeans, silage corn, sunflowers and canola. A seed company of Dow AgroSciences LLC, Mycogen Seeds maintains a robust global research and development program to bring growers high-performance genetics with the latest trait technologies. Mycogen Seeds is committed to helping growers be better acre after acre with dependable seed, smart ideas and hard work. For more information about Mycogen brand products, visit Mycogen.com or follow Mycogen Seeds on Facebook, Twitter and YouTube.